‘Side Impact’ refers to unpredictable life events and the tension between the analogue and the digital (represented by the squares/pixels). It has also been inspired by relativity and quantum physics – the deformation and warping of space (and time) through the forces of gravity and the way remote, distant particles effect each other. I have tried to amalgamate the curvilinear structure and movement of the net with the angular grid pattern rhythm. Squares or pixels pass though the net – and, additionally, from the inside of the frame to the outside world, into real space. The work consists of interacting flat shapes and net elements. Pictorial depth is exclusively achieved through overlapping, obscuring and push/pull effect of colours/tonal variation– to focus attention on the interaction and inherently expressive quality of simple shapes, colours and lines. The squares as pixels refer to their role as part of the logical system underlying digital images – consisting of series of “bits” or ‘binary digits’ – which are the fundamental units of information which relate to digital certainty: true/false, on/off, yes/no – as opposed to the uncertainty of the net’s malleable structure and its analogue quality. Influenced by aspects of Gestalt psychology and the formal elements’ inherently expressive qualities that contribute to create, sustain or release tension, I used these principles to play with the way our minds seek a state of stress reduction, resolution or balance, by combining and fusing net and grid into various states of tension and release, and by counterbalancing the curvilinear flow of the net with the angular, metric grid pattern. 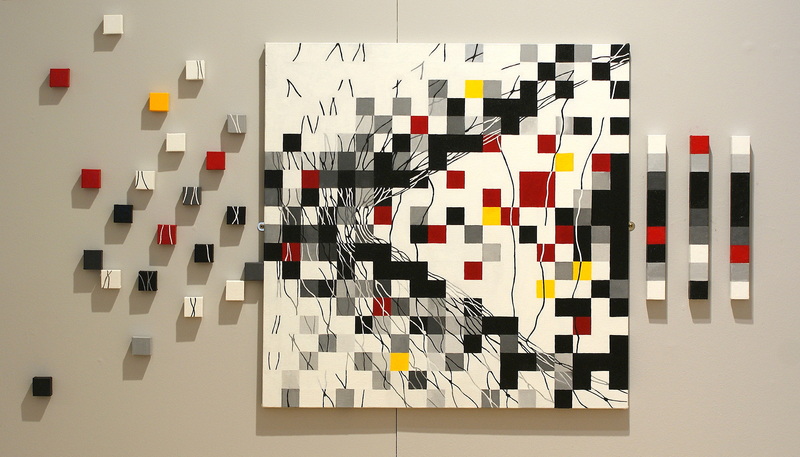 I limited my palette to simple white, black, grey and primary colours (red and yellow) to contrast and balances the complexity of the net/grid and line interactions.